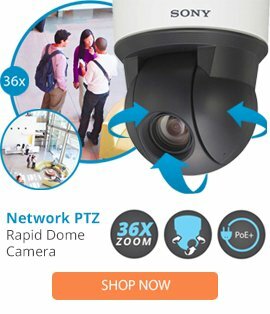 The DF8-PG-E0 is a 8-inch fixed mount domes that are quick and easy to install and can be used in a variety of outdoor applications. The versatile fixed camera mount allows for 360-degree horizontal positioning and will accommodate a camera and lens up to nine inches (22.86 cm) in length when tilted 30 degrees downward. The back box is formed aluminum construction and is plenum rated. Multiple cable hole plugs are positioned in the top and sides of the back box and can be removed to allow cable to be run from any direction. The pendant mount directly to any recommended mount. Gray only for environmental applications. The environmental domes include a sun shield and heater kit and are suitable for use in temperatures to -60°F (-51°C).